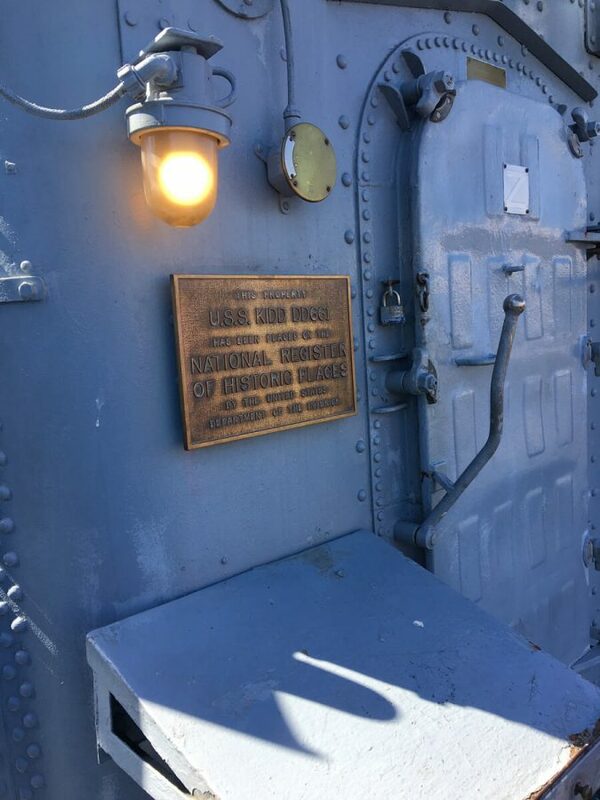 Located behind the aft smokestack on the 01 Level is the 21″ quintuple torpedo tube mount. 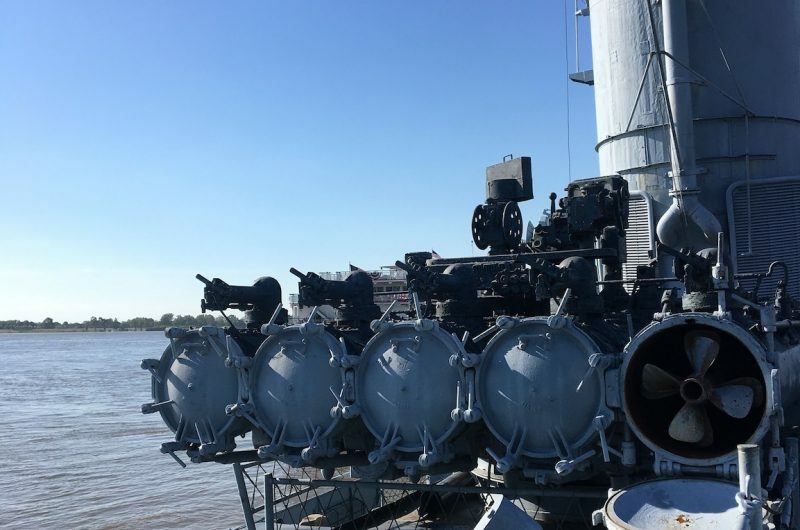 The KIDD originally held two sets of torpedo tubes: one between the two stacks and the one located here. 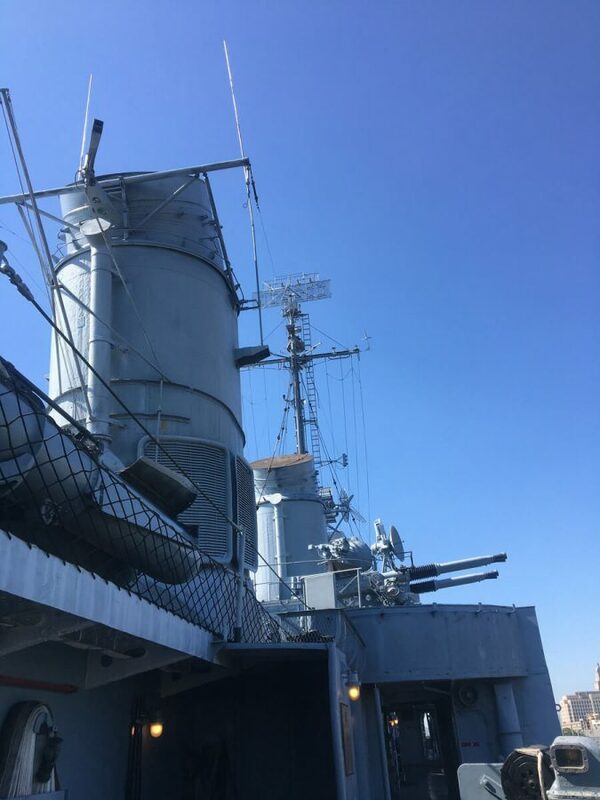 The forward set of tubes was removed during the refit that followed the kamikaze attack of April 11, 1945, replaced by the quad 40mm gun mounts. The tubes could be pivoted out to either side of the ship to point out over the water. The “fish” (the torpedoes) were fired off by igniting a black powder charge at the door-end of the tubes. As the torpedo left the tube, a tripping latch (recessed into the torpedo while inside the tube) would pop up and start the operating mechanisms inside. Each torpedo had two propellers which rotated in opposite directions to keep it from spinning as it plowed through the water and, thus, to help keep it on course. The nose of each torpedo features a spinner-like device on it. This is the arming device for the torpedo’s warhead. As the torpedo moves through the water, the spinner turns. In doing so, it winds an exploder mechanism inside which–after a certain distance–arms the warhead. The torpedo was powered by a steam turbine engine similar in design to the KIDD’s propulsion plant. Compressed air mixed with alcohol and heated water was used to produce steam which drove the turbine geared to the torpedo’s propeller. Once fired, the torpedo took off on its own, heading on a preset course. This was before the days of heat-seeking or guided missiles. The speed, depth, and gyro could be set ahead of time. 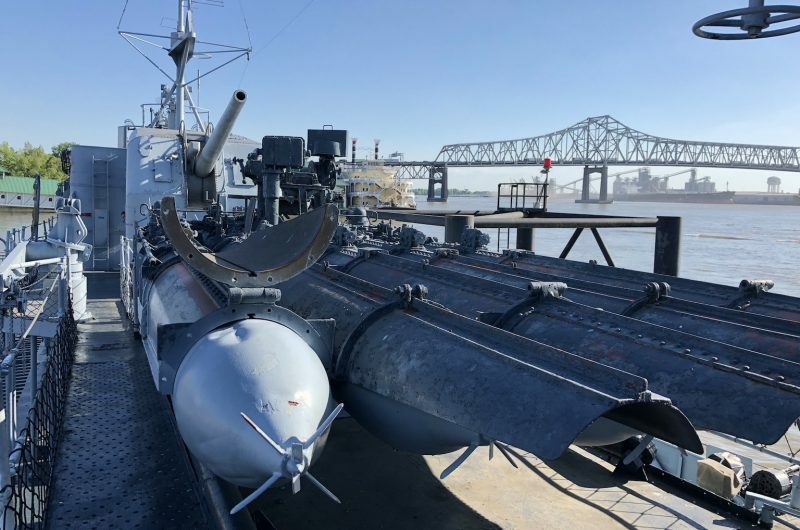 The torpedo featured three possible speeds and ranges: 26.5 knots with a range of 15,000 yards; 33.5 knots with a range of 10,000 yards; and 45 knots with a range of 6,000 yards. 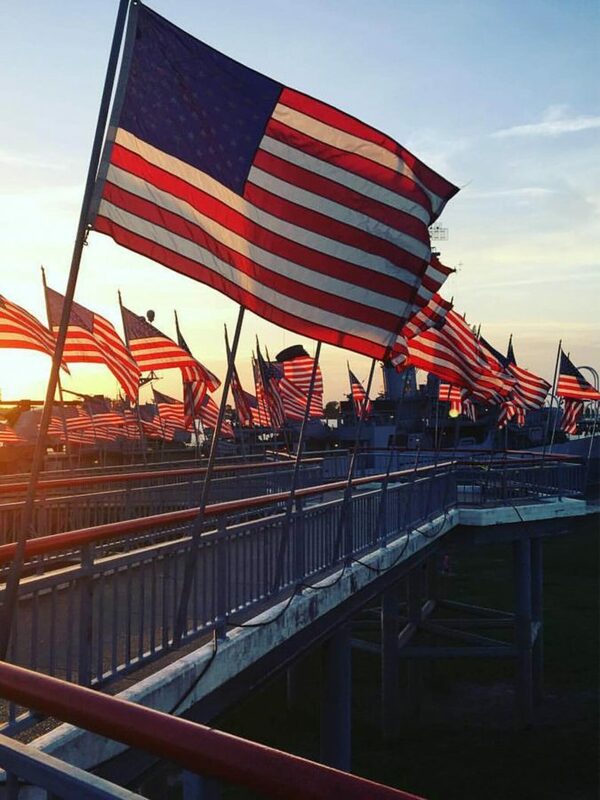 It ranged between a constant, preset depth of four to fifty feet. Each torpedo weighed almost two tons and carried a warhead of over 800 pounds of high explosives. No spares were carried on board. Reloading was done in port. A telescoping torpedo crane was mounted aft of the tubes. Torpedoes were hoisted up by a chain fall, lined up with the breech of the torpedo tube, and slid into the tube. Loading the tubes was heavy, strenuous labor. Torpedoes were intricate and so careful, delicate maintenance was required to insure that they would function properly. 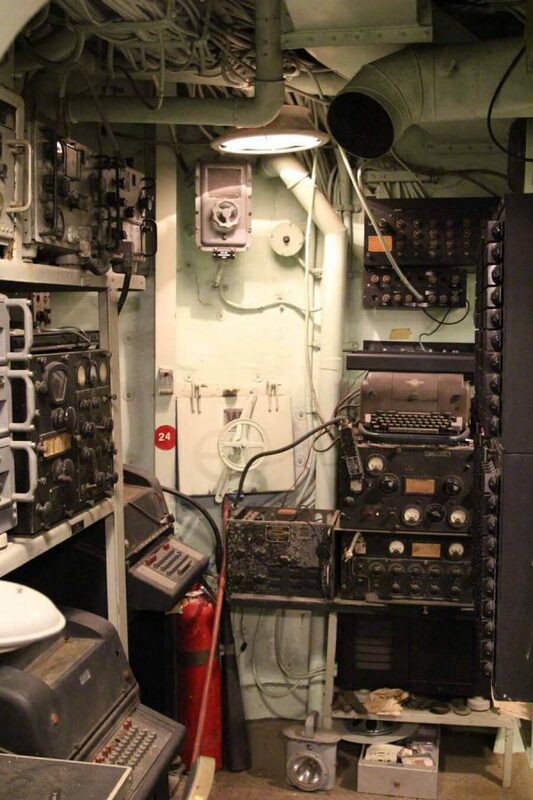 Normally, the aft torpedo tubes on the KIDD would have a small blast shield enclosing the control station atop the tubes. 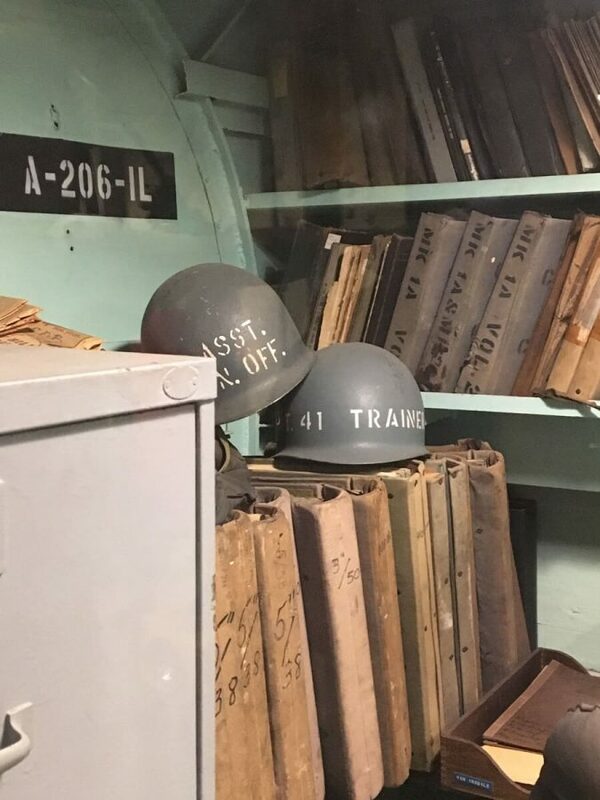 This shield was not for protection from enemy fire so much as it was for protecting the torpedomen from the concussion and roar of 5″/38 caliber Gun Mount 53 which is just aft of the tubes. The blast of a 5″ gun can be quite deafening and so the concussion shield was needed here. This is one of the last major pieces of original equipment needed to bring KIDD closer to her 1945 configuration. Three men operated the tubes: a trainer, gyro setter, and mount captain. 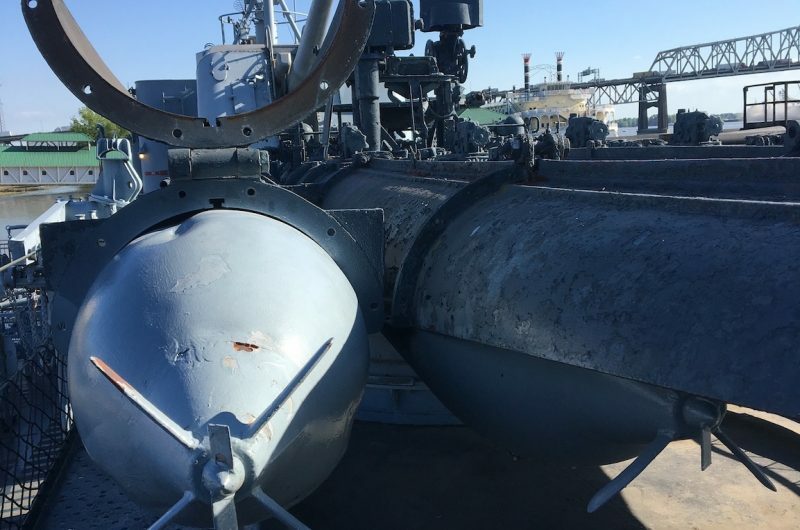 The torpedoes could also be fired remotely from two remote directors located on the bridge.